What is Foundation Art and Design? The Foundation Diploma in Art & Design is an ideal choice for those wishing to progress to study Art & Design at degree level. Our students’ progress to prestigious institutions and the course has built up an excellent reputation. Creativity, individuality and experimentation are key to success on this course. The intensive, full-time programme emphasises problem-solving, idea generation and critical thinking. You will be encouraged to take creative risks and work outside your comfort zone, learning through exploration. 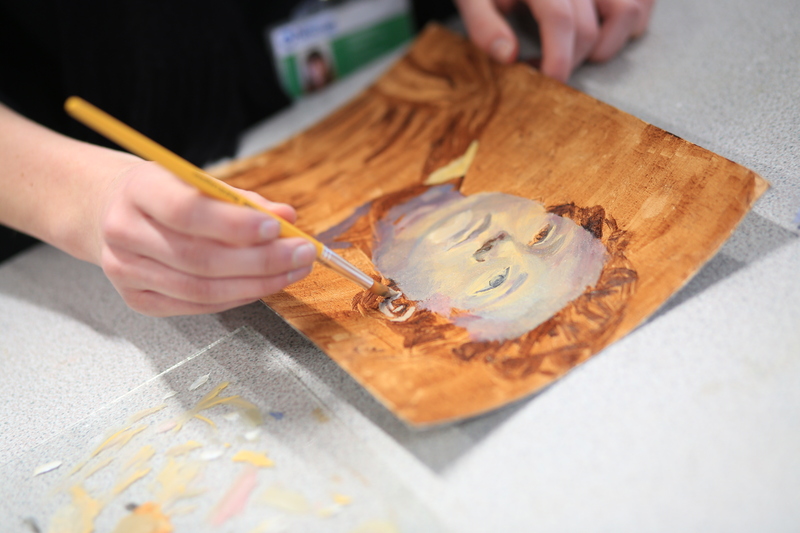 You will work with a team of experienced and enthusiastic subject specialists and learn through playful experimentation, exploring projects across a range of disciplines, such as Fine Art, Textiles, Graphics and 3D. Throughout a challenging and highly rewarding year, you will be allowed the freedom to discover your own creative specialism and supported in securing your plans for the future. Tutors will guide you through the UCAS application process and help you find the most appropriate course for your future development. Admissions tutors at highly selective institutions look favourably on applicants with a Foundation Diploma. This stage will introduce you to a wide range of activities, delivered by specialist teachers. You will complete a series of set assignments to develop your drawing, making and technical skills across all areas. During this stage, the key focus is development of drawing skills, experimentation with new media and materials, as well as use of historical, contemporary and cultural research to inform your own practice. This stage further develops the skills from stage 1 as you make your decisions about your preferred choice of degree subject. At this stage you will decide on a theme for your Final Major Project. You will have the opportunity to develop your written analysis and take part in gallery visits to research artists and designers’ work to inform your own practice. The Final Major Project is the culmination of the course and an opportunity to further refine and demonstrate specialist skills. Life Drawing and Art History modules are compulsory elements of the course and these will run throughout the year. Foundation Diploma in Art and Design students secure places on a broad range of exciting and prestigious Art and Design degree courses across the country. We maintain strong links with universities and recent progression has included: Chelsea College of Arts – Textiles Design, University of Manchester – Architecture, Central St Martins – Graphic Design, Manchester Metropolitan University – 3D Design, London College of Fashion – Fashion and Textiles, University of Huddersfield – Illustration, London Metropolitan University – Fine Art. – All applicants must submit a portfolio of work for review as a part of the application process.